Choose any name to personalize this solid Sterling Silver (.925) necklace. 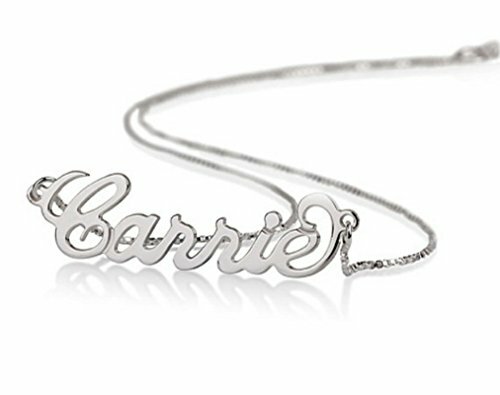 This beautiful classic Carrie style name pendant hangs from a shimmering Sterling Silver Box chain. You may choose a chain length. Chain lengths are: 14",16", 18", 20", 22". Please provide personalization details in the Gift note box - or promptly send it to us through Contact Seller after your order has been placed. Necklace thickness is 0.7mm / 0.03" with 5-7 mm / 0.2-0.28" height. After order is complete we ship all orders within 24 hours.